Mothers are always looking for great ways to save money and do things themselves. While some baby things can last for quite awhile, baby wipes seem to disappear in a heartbeat. They are so expensive and even when you buy a big canister of them you can’t be sure they will retain their moisture if the top is left open. Wouldn’t it be great if you could make your own DIY cloth wipes for your baby? Baby wipes are such an expense and if you are also spending money on diapers (either cloth or disposable) the total cost can be astronomical. When it comes to a pack of baby wipes, you can spend upwards of nearly $4 for a relatively small pack of baby wipes. If you decide to go for the more affordable wipes, you have to contend with a product that is so thin you have to use quite a few to finish the job. Thankfully, a DIY alternative can save you time and money! With this wonderful tutorial, you can learn just how easy it is to make your own DIY cloth wipes. The key piece of equipment is going to be your handy mason jars – track them down from home or obtain an affordable case of them from the grocery. The cloth wipes can be made from baby wash cloths with simple soap and baby lotion. With these simple steps, you will be able to create your own cloth wipes in a manner that is green thinking and cost effective. You can buy baby washcloths by the package and, with this process, they can last a long time. 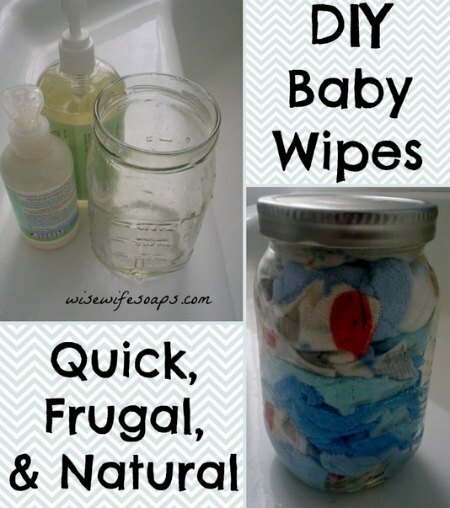 Using baby wash cloths, soap, baby lotion, and resealable mason jars you can make your own wipes that you can reuse repeatedly. The recipe is simple and when it comes time to refresh the wipes, you only need to throw the wipe into a bag and toss them in with your cloth diapers into the wash.